Working together, the designer and owner of this fabulous Clayton residence achieve a perfect balance of contemporary styling and comfort. A dining room ensemble from KDR Designer showrooms was the first new acquisition in the home and was grabbed before it was even off the truck. Faced with limestone from floor to ceiling, the raised gas fireplace is the focal point of the room. 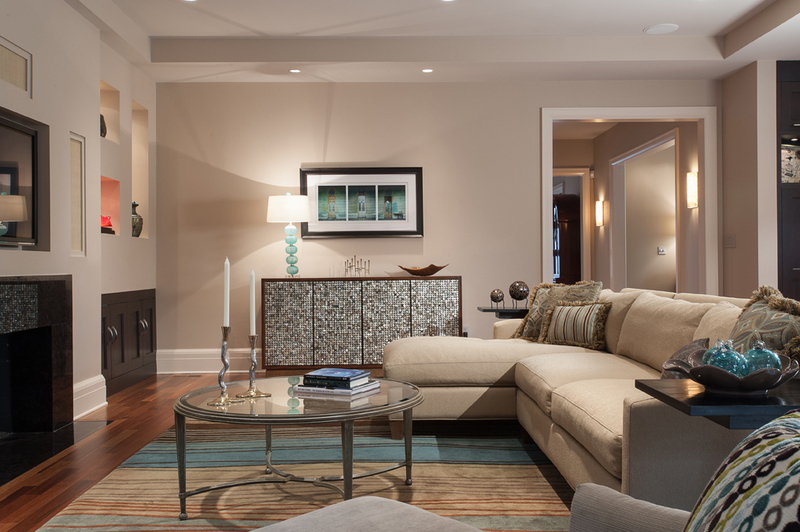 “We want it to be sophisticated, but comfortable.” Whatever the preferred design style, interior designers will often hear some version of that directive from their clients, with “comfortable” being the operative word. For designer Sandra Ford, however, creating “comfort” starts long before a single paint color or piece of furniture is selected. She spends generous amounts of time listening attentively to her clients, assessing their lifestyle, personality, taste and vision. Her ability to establish a comfort level with homeowners undoubtedly explains her long-term client relationships, some of which have lasted for more than 20 years. It’s a skill she learned from her dad, who was a well-known, convivial storeowner in small-town Missouri. “My father never knew a stranger,” she says, and that lesson has contributed to the success of Sandra Ford Design Consultant, Inc., since 1982. In fact, Sandra’s professional relationship with the owners of this spectacular custom two-story in Clayton began 15 years ago. She’d designed two previous homes for the family, was well attuned to their personal style and preferences and looked forward to working with them again. Soon to be empty nesters, the couple had decided to downsize from their large home in Ladue. Initially, they’d planned to build, but found this immaculate six-year-old residence in 2012. The floorplan was near perfect, and the property met all of their qualifications, including a more manageable yard, a pleasant “neighborhood feel,” and a great location within walking distance of downtown Clayton. With 4,500 square feet on the main levels, a finished lower level, 10-foot ceilings and Brazilian hardwood floors, the interior was well suited to the owners’ vision of a relaxed, contemporary living environment. The existing décor, however, was starkly contemporary and somewhat dark. “We wanted to warm and soften it, to add more color and texture,” Sandra explains. 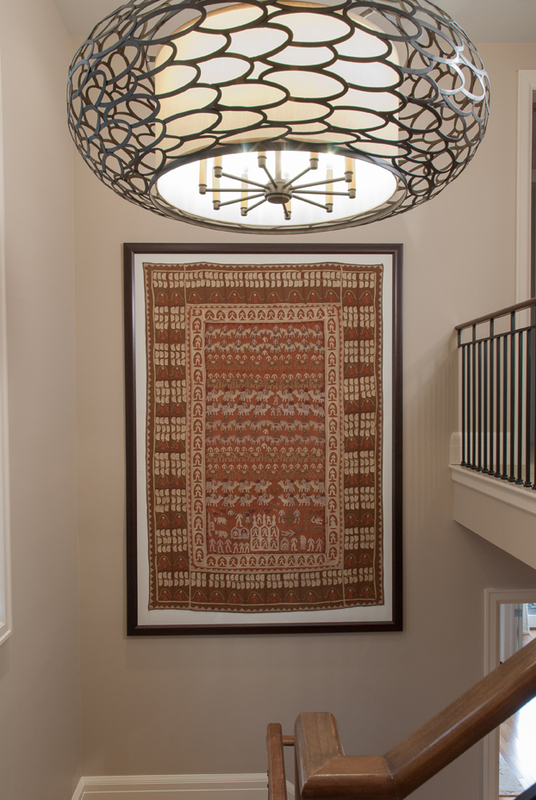 After lightening the wall colors and painting the extensive trimwork cream, she and the wife began a room-by-room redesign, carefully selecting certain pieces from the previous home and purchasing new furnishings to complement each space. The end result is a seamless blend of contemporary, transitional and mid-century modern styling that is both comfortable and visually stunning. Their first new acquisition was a Thomas Pheasant-designed Baker dining ensemble from KDR Designer Showrooms for the formal dining room. “We grabbed it before it was even off the truck at the showroom!” the owner laughs. 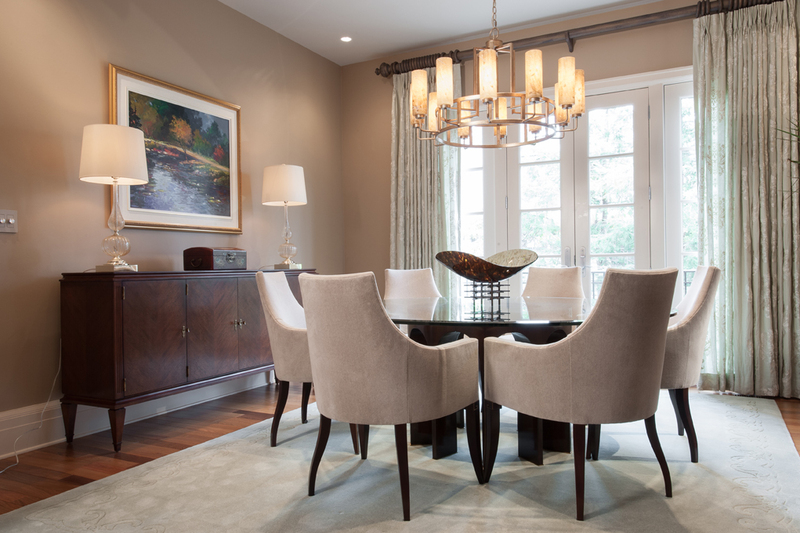 The circular glass-topped table has a mahogany base and is surrounded by sleek dining chairs in gray-beige velvet. A trademark lumen vessel by Scott Amrhein of High Cliff Studios in Wisconsin serves as the centerpiece. Custom-made to fit the dining ensemble, the Kaim-Kisner rug is an elegant shade of celadon, and both the hue and the rug’s border pattern are repeated in linen-and-silk Cowtan & Tout draperies from KDR. A light mahogany, mid-century Hickory Chair console is positioned against one wall, and on the opposing wall is a classic mahogany breakfront from the owners’ former home. Humorously referred to as the “media room,” the formal living room is well used, since it was the only location that could easily accommodate the family’s 70-inch flatscreen. To ensure the informal elegance of this space, Sandra chose a massive, handcrafted cabinet by Theodore Alexander, positioning the dramatic showpiece beneath the screen to serve as a media cabinet. 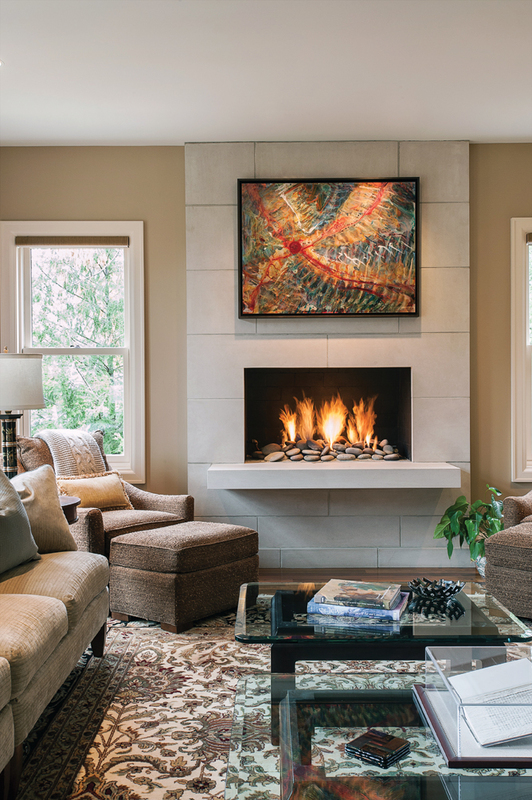 Faced with limestone from floor to ceiling, the raised gas fireplace is the room’s focal point, uniquely designed with a limestone “shelf” in place of a hearth. Adding a splash of color, the fireplace is embellished with a vibrant abstract, reverse-layered on acrylic by Dallas artist Christopher H. Martin, from the Kodner Gallery. Similarly intriguing, a piece of “book art” by renowned St. Louis artist/writer Buzz Spector is displayed on the coffee table, and another of his works hangs in the entry foyer. The living room’s color scheme was determined by its richly hued Persian rug, a center medallion design and a favorite from the Ladue home. Flooding the space with natural light are three sets of French doors, appointed with remote-controlled blinds and draperies in a grid sheer cotton/linen from Groundworks. Textured throw pillows accent the Century sectional, which is upholstered in a warm velvet striae, and high-back lounge chairs with ottomans provide cozy fireside seating. 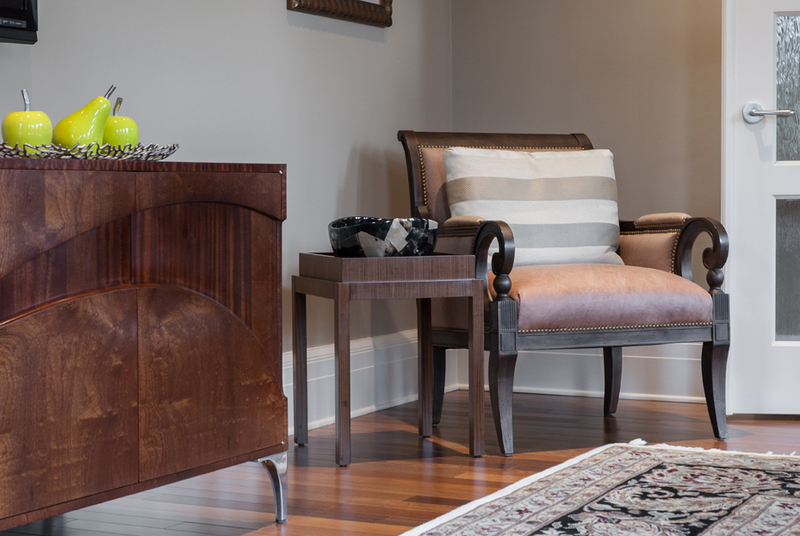 Challenged by a problematic corner, Sandra transformed it into an ideal setting for a transitional, nailhead-trimmed leather chair and handcrafted Theodore Alexander occasional tray table. Comfort, convenience and durability are the watchwords in the vast family/entertainment space. The kitchen, hearth room, and dining area are completely open and overlook the beautifully landscaped patio and lower-level swimming pool. A huge 6-by-12-foot granite island, with built-in five-burner range and wine cooler, defines the boundaries of the kitchen, and lustrous contemporary cabinetry conceals built-in stainless appliances. 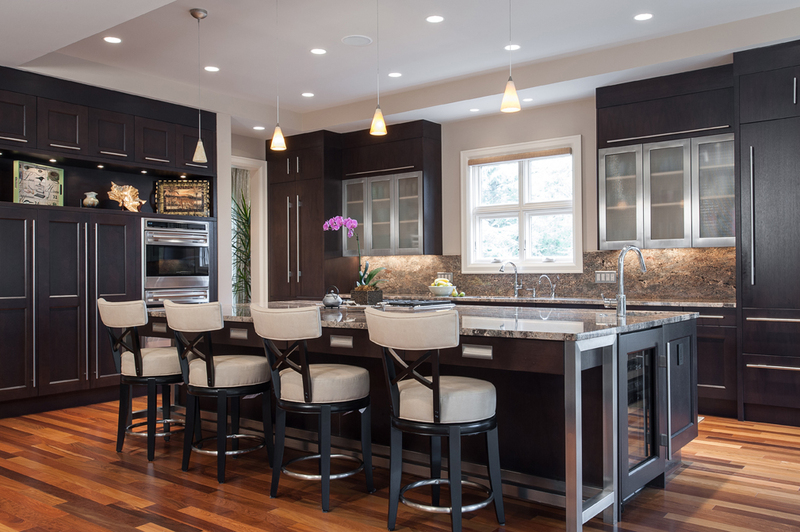 For quick snacks, Designmaster swivel bar stools in faux leather are tucked under the island’s overhang. Casual meals are served on a gleaming alder plank draw table that seats from eight to 12, and the table and tufted Designmaster dining chairs in a crosshatch pattern are arranged on a custom textured wool rug from Winschel Carpet. Blanketing the hearth room floor is a magnificent Tibetan wool rug from Tufenkian in lush contemporary stripes of chocolate, gold and teal. Lighted display niches flank the granite fireplace and showcase several sculptural pieces, including an Ah Leon ceramic and a Chihuly glass. The generously proportioned, neutral-toned KDR sectional is upholstered in a durable and easy-to-clean cotton/synthetic blend, and the circular coffee table has a glass top and champagne-glazed alloy frame. As eye-catching as it is functional, the bar cabinet from Baker Design Galleries is lavished with iridescent mother-of-pearl disks. On the wall above is a triptych from photographic artist Michael Eastman’s Cuba series, and in the far corner, a baby grand piano completes the aesthetic of this spectacular activity area. Contemporary, yet wonderfully comfortable and inviting, this extraordinary residence illustrates the importance of a harmonious designer/client collaboration. 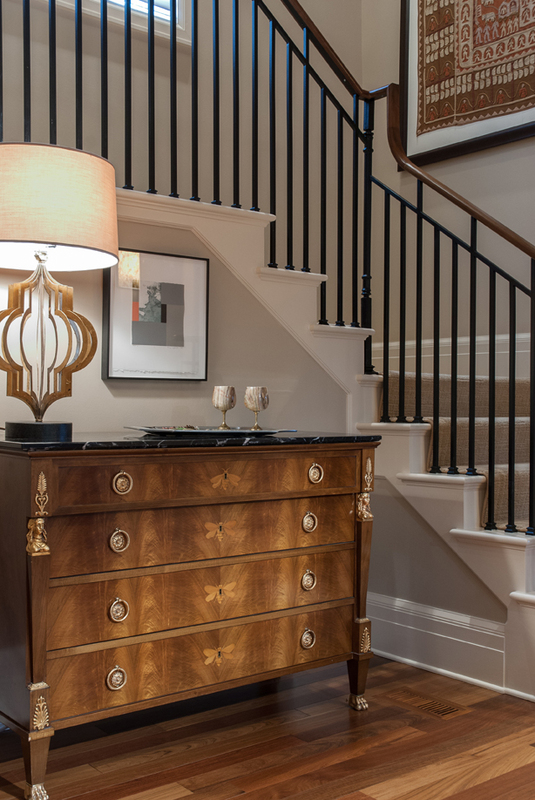 And, like scores of fine homes in some of St. Louis’ most prestigious neighborhoods, it reflects the impeccable styling of Sandra Ford Design Consultant, Inc.